Eight outdoor pools, plus indoor options too. Let the lazy river work its magic, and forget about all that "real life" stuff for now. Pull aside the curtains and soak in the view from your living room or balcony. Some quality time at the fitness center will make you feel way less guilty for stopping at the onsite Ben & Jerry's later. Well, anytime really. There's a Starbucks right on the resort property. Located right along the Grand Strand on Myrtle Beach. Relax as you float along the 418 foot lazy river surrounding the pool area. Escape the cold weather and go for a swim in the indoor pool. Stop by the tiki bar on the pool deck for a snack or a refreshing drink. If you're feeling adventurous, try Voodoo Juice, a mix of rums and fruit juices. With a 70-year track record of (practically embarrassing they’re so nice) rave reviews, The Breakers Resort does the near-impossible: it just keeps getting better. Two-time “Best of the Beach” winner, the sprawling beachfront resort caters to splash-happy families with one of Myrtle Beach’s longest stretches of sand and nineteen indoor/outdoor pool and hot tub options. The hands-down favorite is a 418-foot lazy river, which winds its way around the pool deck area – so park yourself on a lounger nearby with a drink from the poolside bar. When the kids finally come looking for a dry towel (and they will eventually), surprise them with a stop at the onsite Ben & Jerry’s ice cream shop. Let the kids hang out in the children’s club while you get in a workout at the fitness center. A post-workout visit to the sauna is a must. Treat yourself to a frappuccino at Starbucks, grab some free DVD rentals from the kiosk and head back to your condo for a breather before dinner. One- to two-bedroom condos sleep six guests and have Ocean or Oceanfront Views. One-bedroom condos have kitchenettes which allow you to prepare the basics. The Full Kitchens in two-bedroom condos give you plenty of room for top-your-own taco extravaganzas and late-night Uno rematches. Stop by the nearby Piggly Wiggly for groceries. Be sure to save a splurge night for the oceanfront bar and grill, with seasonal nightly live entertainment. Back in your condo, gather everyone on the couch with the DVDs you picked up earlier and get ready for a fun family movie night thanks to your Flatscreen TV with Cable and DVD player. Visit the on-site laundry facility to clean a load or two before packing up to head home at the end of your vacation. Golf aficionado? Let the resort golf directors set you up with a whirlwind tour of the top local courses, like Whispering Pines. 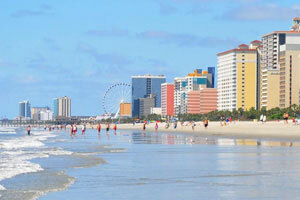 You can even get free and discounted admission to Myrtle Beach’s main attractions – just ask at the front desk. Shopaholics will love Broadway the Beach. The Mole Hole has collectibles and gifts. Pick up a new pair of flip-flops at the Flip Flop Factory or some shades at Sunglass Hut (there are three locations!) Kiddos will love Build-a-Bear where they can create their own stuffed animal. Magicians-in-training will love Broadway Magic. It features several magic tricks and supplies as well as novelty gifts. When you get hungry, there’s Extreme Pizza, Señor Frogs and Key West Grill. Take a fun family ride on the SkyWheel and enjoy the amazing views of Myrtle Beach from almost two-hundred feet in the air.